How do I Manage Volunteers who Forget to Sign-Out of their Shifts? Why am I unable to sign up with my username and asked to reset my password? Welcome to our Webinar Schedule information page. Below is a schedule of the days and times of our free weekly webinars. This is a live webinar where we walk you through the software from start to finish and answer any questions you may have. Visit the main Organization tab (i.e. select your organization’s name along the left-hand side) to set up your organization’s profile in Charity Republic. – Include a general description of your organization. Note: This information will appear in volunteer opportunity posts. • Options: Select fields that can be edited or accessed by volunteers and/or supervisors. Assign access levels to Supervisors by Department of Site. Visit the Volunteers tab to view, add and invite volunteers to use Charity Republic. 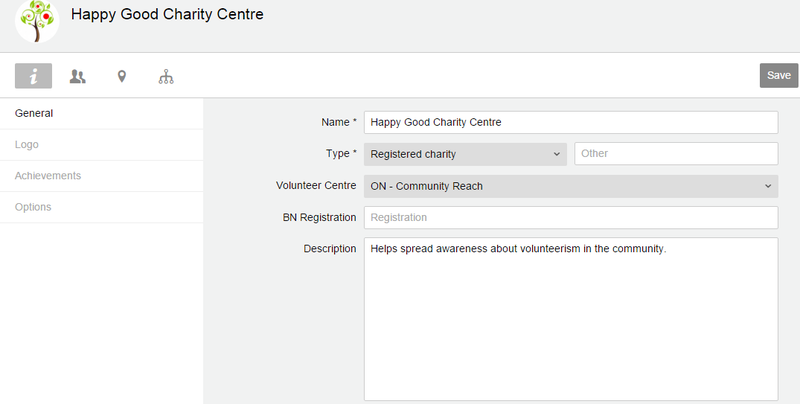 NOTE: See Tip at bottom for a quick way to upload your volunteers into Charity Republic. and Invite button and they will receive an email invitation to register. Otherwise, simply Save the volunteer’s profile. • Create detailed volunteer profiles for each of your volunteers, including Contact information, Position, Employer, Language and Skill information. Plus, Attachments, Notes, Hour tracking and Achievements (e.g. police check, awards, training). Visit the Opportunities tab to post volunteer opportunities for your volunteers or to recruit new volunteers. Visit the Scheduling tab to schedule volunteers or have volunteers sign up for shifts. • Select the Mail icon (top toolbar) to communicate and send messages to your volunteers. If your volunteers have an email attatched their profile, they will recieve a copy of the message in their email account. Instead of adding volunteers manually one-by-one, we can upload a volunteer list for you (click here for the template > select File > Download as > Microsoft Excel). 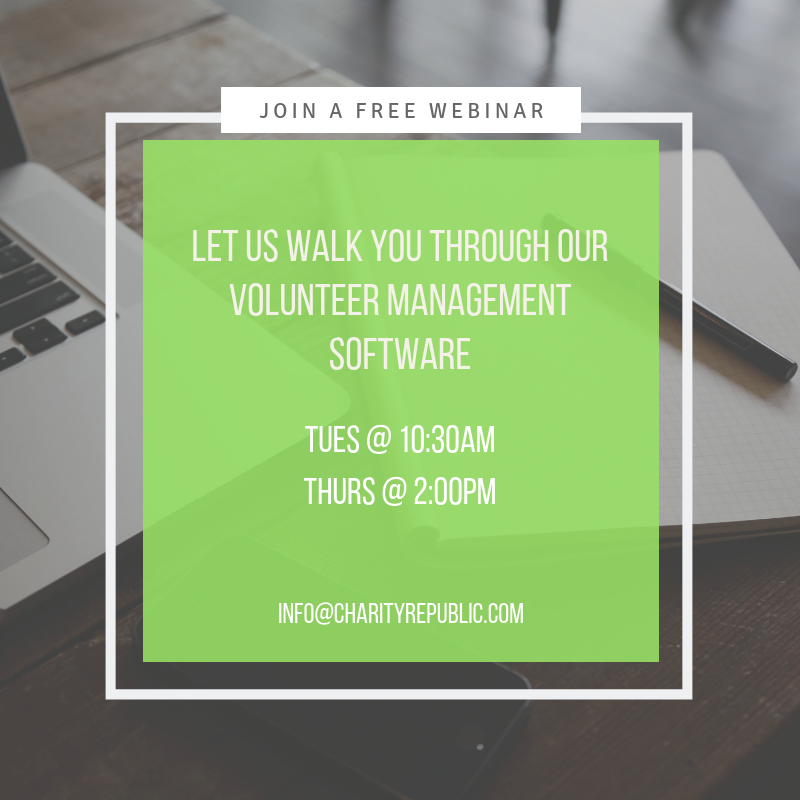 Q: How do I add a new Volunteer, Supervisor or Administrator to use Charity Republic? Name: First Name and Last Name of the volunteer. Status: The status of the volunteer (e.g. Active, Pending Approval). Started: The date the volunteer started to volunteer with your organization. Q: How do I invite a Volunteer or Supervisor to use Charity Republic? The following screen will appear. Enter the email address here (the email address will autopopulate if an email address has already been added to the volunteer’s General profile). When the Send button is selected, they will receive an email invitation to create a Charity Republic account. Q: What does a Volunteer and Supervisor invitation look like? 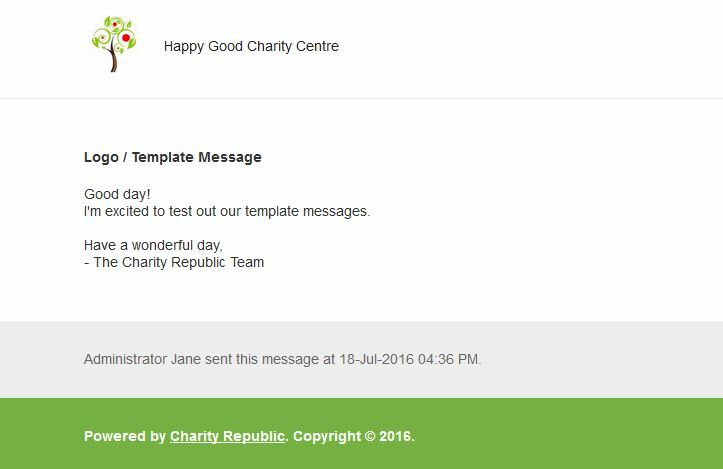 When a volunteer has been invited to use Charity Republic, they will receive an email message as follows. Both the subject line and the message will include the name of your organization (e.g. Happy Good Charity Centre). The volunteer simply selects the Accept link to create a volunteer account with their own username and password. A volunteer’s username appears in the General tab (first tab on left) of their volunteer profile. Also, we can upload your volunteers for you. Simply fill out the excel template we provide and share it with us for uploading (it takes 5 minutes on our end)! Q: How do I know if a Volunteer has accepted the invitation? A: Select a volunteer. At the bottom of the General tab (first tab on left), it will indicate whether the volunteer has accepted the invitation. Q: Can we just add a Volunteer without inviting them to use Charity Republic? – What if a Volunteer does not have an email address? – If we don’t invite the Volunteer, are we responsible for adding all of the Volunteer’s information? A: It’s your choice as a coordinator whether to invite a volunteer to use Charity Republic or not. Perhaps some of your volunteers are not tech savvy, or you prefer to have full control over a volunteer’s profile. We can bulk upload volunteers and relevant profile information for you. In case you need help uploading your existing volunteers into Charity Republic, we can share the Excel template with you. You also have the ability to invite a segment of your volunteers (e.g. youth, volunteers that are comfortable with technology). Either way, the Administrator and Supervisor will have access to all Volunteer Profile information for editing if required. Q: What if my Volunteer does not have an email but I still want them to manage their own profile? A: The Administrator or Supervisor can send the volunteer invitation to themselves and create an account for volunteers in this situation. NOTE: Ensure that the Administrator or Supervisor is logged out of their account before “Accepting” the email invitation. Otherwise, the volunteer will be linked to the Administrator or Supervisor account. Q: What happens if my volunteer registers as an organization (Administrator) instead of as a volunteer? A: When a volunteer registers as an organization, simply send your volunteer an invitation (see instructions above). The volunteer can then click on the link in the email invitation and instead of registering for another account, they can log in using the same username and password they originally created. Q: What happens if my Volunteer or Supervisor did not receive the invitation? A: It’s not common for email invitations to be marked as junk, but sometimes they can get caught through spam filters and go to Junk folders. Please have your volunteer double check their Junk folder. If there is a Search function in the volunteer’s email client, they can also search on “noreply@charityrepublic.com” to locate the email. Finally, a volunteer can add “noreply@charityrepublic.com” to a Safe Senders List so that it does not get blocked in the future. Q: How does an organization register for an account? Organization: The formal name of your organization. Email: The email address of the person registering. Username: The username that will be used to access the account via the Login page. Referral: How did you hear about us? Select referral source that applies. Remember that you only need one organization account. You can invite volunteers and supervisors to join your organization from this main account. Q: By registering, am I committing to using the software? A: There is no commitment to using Charity Republic. We offer 2 month free trials and organizations can choose to continue and pay month-to-month or on an annual basis after their trial is complete. Otherwise, organizations can discontinue use of the software after their trial. Note: We do not require credit card information in order for organizations to register for a free trial. A: Charity Republic does not sell user data or advertise to users. We have an SSL certificate and our data is stored on a secure server. Note, we work with over 35 school boards and universities and we’ve been through multiple security reviews to ensure we meet privacy and security requirements. Here are our User and Privacy agreements. Q: Who qualifies as a grassroots organization? Note: We determine eligibility on a case-by-case basis. A: Charities and non-profits can recognize volunteers for the skills they demonstrated while volunteering by creating PREB-Ontario certificates. These certificates outline tasks and activities in detail, based upon the National Occupation Classification, and also detail key aspects of a volunteer’s experience, such as hours of volunteering completed, activities performed, special achievements, training obtained and special comments by supervisors. PREB-Ontario is administered by the Ontario Volunteer Centre Network part of the Volunteer Legacy initiative from the Pan/Parapan Am Games and has been made possible through funding support from the Government of Ontario. If you’re a volunteer Administrator or Supervisor having issues with volunteers not signing out of their shifts, then this feature is for you. Volunteers using our Sign-In feature (more details here) will automatically be signed out after 4 hours (you set the time), for instance, and have the hours auto-calculated for them. For more details on how to use this feature, please follow the steps below. First, set up the hour parameters via the Organization section. Click Setting. Set the time limit here, and Save. 2.Go to desired volunteer and click Sign In. The Sign In button will become green and say ‘Sign Out’ to indicate that a volunteer has already signed in for a particular shift. If the shift is an open shift with no specific volunteers invited to the shift, then the volunteer does not have to be scheduled for the shift to Sign In. 3.After a certain number of hours (e.g. 4 hours), the volunteer will automatically be signed out and have 4 hours created for them. 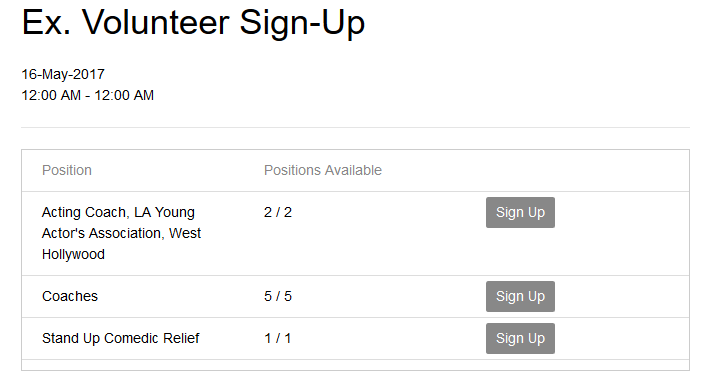 4.To locate the volunteer’s hours, select the desired volunteer and click on their Hours tab. If you need to verify or edit the hours, please click on them. 1.Once signed in, a volunteer’s dashboard will appear. 2.Scroll down to the Sign In / Sign Out area that allows a volunteer to Sign In for their shift. Click on the Sign In button to start tracking hours. The button should now become green and say ‘Sign Out’. 3.After a certain number of hours (e.g. 4 hours), the volunteer will automatically be signed out of their shift and have 4 hours created for them. The Sign In/Out button will also appear as grey and say ‘Sign In’ to indicate that the volunteer is now signed out of their shift. 4.Volunteers can access their hours by selecting the Hours tab in their profile or in the left-hand panel of the website. Q: How can I connect (or link) two accounts together? 1. Ensure you are logged into your main account. 2. Accept the email invitation or Send (“Save and Invite”) and Accept the invitation from the user profile you wish to connect your main account to (refer to relevant FAQ). Once accepted, the new account will automatically connect to your main account. TIP: To switch between accounts, either click directly on the left toolbar, or use the drop-down in the top left corner of your dashboard. Please use this username for whenever you may need to sign into Charity Republic. 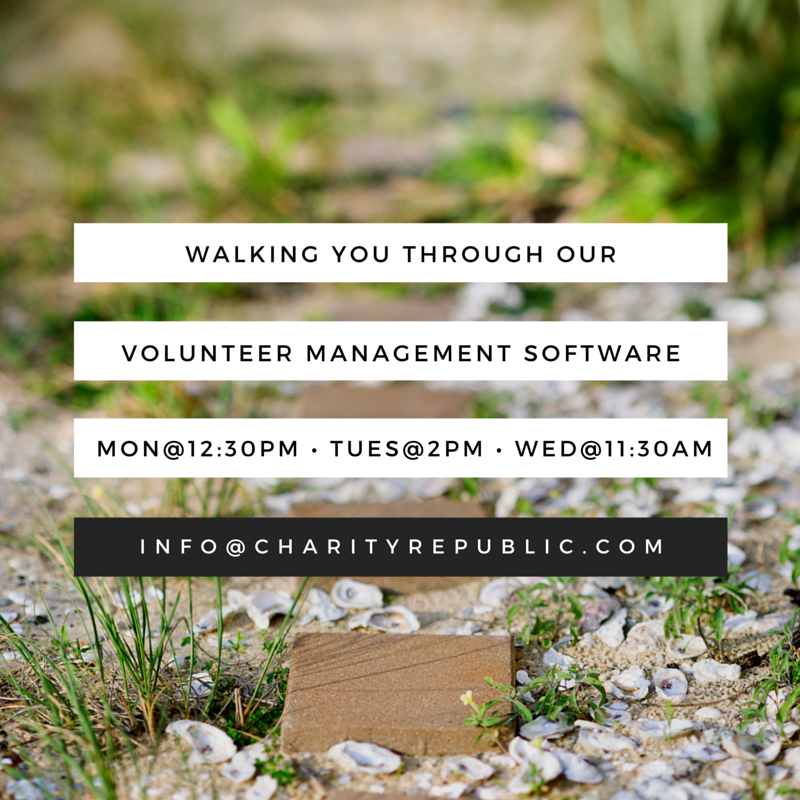 Charity Republic comes with a messaging system to help you stay in touch with other members of your organization. Q. How do I access my messages? A. You can access your messages by clicking on the icon in the top right corner. Your messages are listed on the left and can be read by clicking them. Q. How do I send messages? A. From your message page, click on the icon in the top right corner to create a new message. Select which volunteers you want to send the message to by clicking “Choose volunteers” next to Recipients and checking off the desired volunteer(s). You can add a subject, type out your message, and add attachments as desired. Click Send when you are done. A copy of your message will appear in your inbox. Each person you sent a message to will receive the message in their Charity Republic account and through their email. When selecting recipients, it will tell you the email address of each recipient. Q. How do I reply to messages? A. You can either reply to messages by sending a message back to the original sender through Charity Republic or by replying to the message through your email. Volunteers who do not have a Charity Republic account will only be able to reply to the message they receive in their email. Q. How do I include my logo in messages? Why isn’t a volunteer receiving email invitations? If the contact’s email has been inputted incorrectly (e.g. spelling errors), then the invitation will not go through. Please ensure that volunteers have provided the correct email address and that there are no errors in spelling. NOTE: You can confirm a volunteer’s email (and username) via a volunteer profile. To view volunteer profiles, click Volunteers on the left side and search for the volunteer in question. Emails from “noreply@charityrepublic.com” may be directed to spam filters depending on the email firewall in use by a volunteer. Please ask the volunteer to check their Spam and/or Junk folders and to add “noreply@charityrepublic.com” to a Safe List. Q: How do I delete volunteers in Charity Republic? Q: What if I delete a volunteer profile by accident? A. If you accidentally delete a volunteer, contact us at info [at] charityrepublic.com as soon as you can and we will do our best to restore the account for you. How do volunteers sign up for shifts they are not scheduled for? Supervisor and administrators can create shifts that have certain positions that need to be filled without scheduling specific volunteers, allowing any volunteer to sign up for these positions. For information on creating shifts, scheduling volunteers, and specifying which positions need to be filled, see our FAQ post here. Q: How do supervisors and administrators accept a volunteer sign up? Q: How do I schedule a recurring shift? If you are creating a new shift, fill out the shift information (e.g. start and end date). For both new and pre-existing shifts, ensure that the start and end date is the same or else the recurring shift will not function properly. 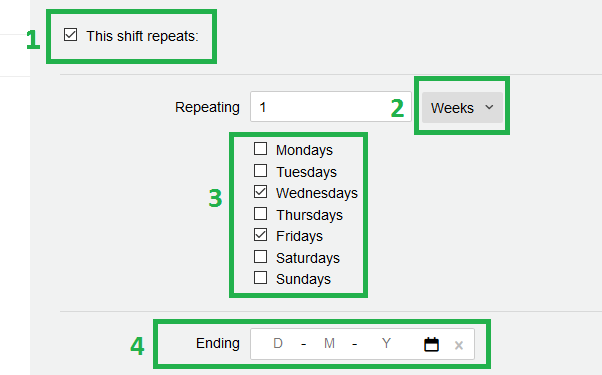 Once in the Recurring tab, you check the “this shift repeats” box (1, see image below). Select the frequency with which you want the shift to repeat from the dropdown menu (2). You can have shifts repeat across days, weeks, or months. In days and weeks, you can select what days of the week a shift repeats (3). Q: How do I edit recurring shifts? Q: How do I delete recurring shifts? How do I change someone to a volunteer, supervisor, or administrator? 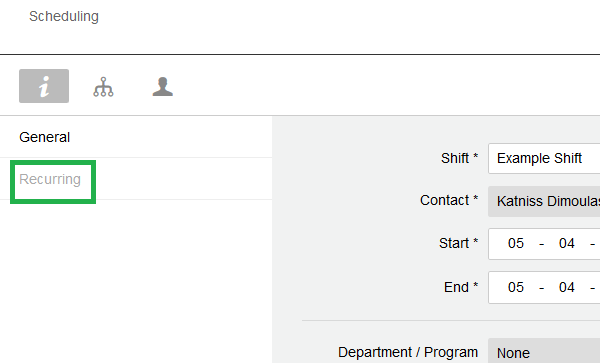 The dropdown menu (pictured above) will state the person’s current position.